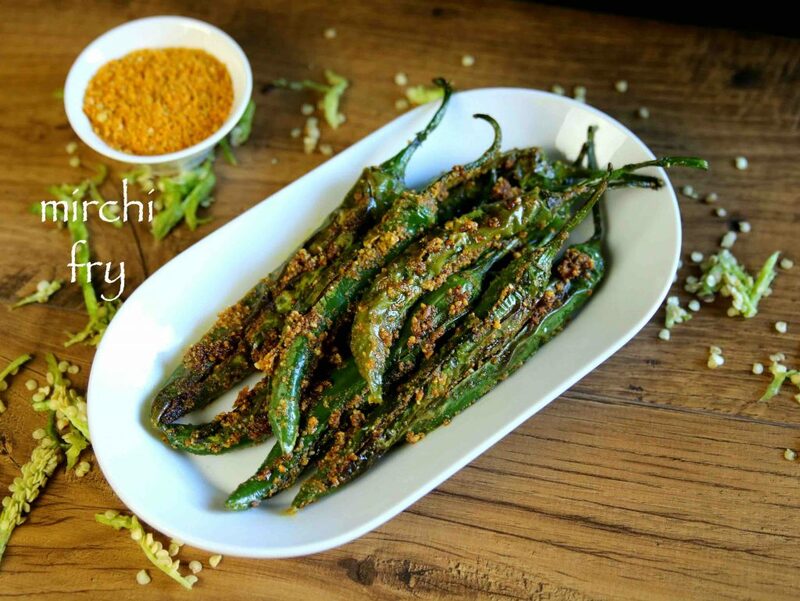 mirchi fry recipe | stuffed green chilli fry | bharwan mirchi fry recipe with detailed photo and video recipe. 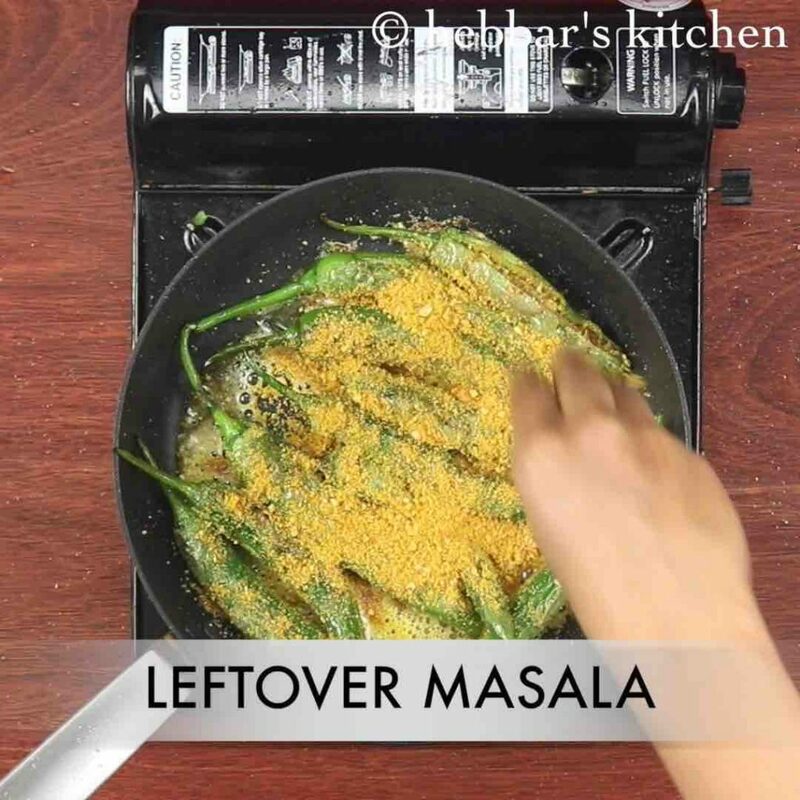 a simple spicy stir fried green chillies or hari mirch based snack recipe which is also used as side dish to main meals. these stuffed chillies are prepared from stuffing the peanut based spice mix to green chillies and the pan fried until crisp. 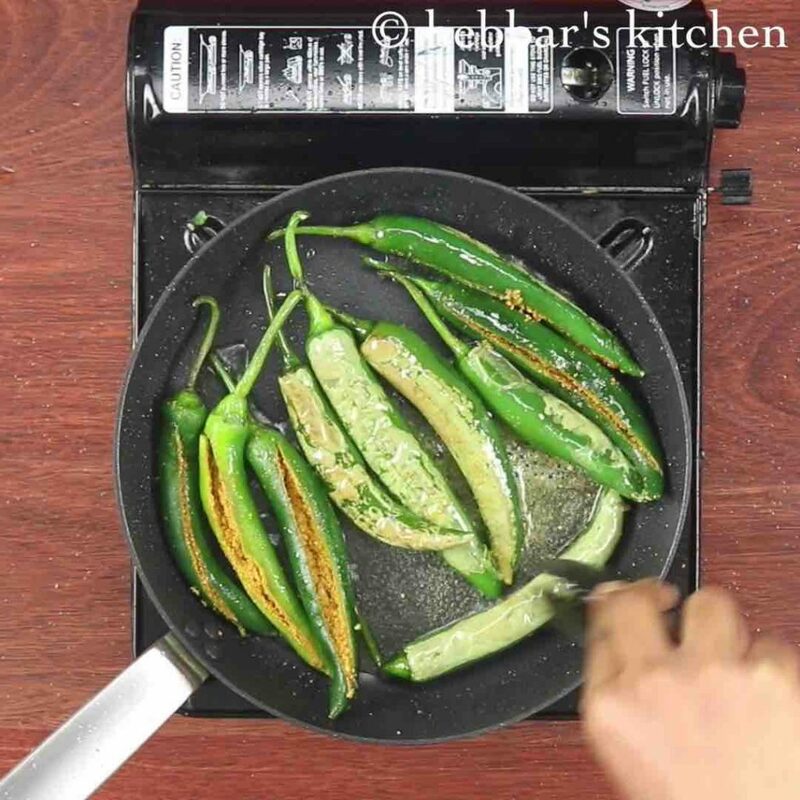 mirchi fry recipe | stuffed green chilli fry | bharwan mirchi fry recipe with step by step photo and video recipe. a simple lip smacking spicy side dish from south indian cuisine which can be prepare with or without the peanut based stuffing. traditionally these hari micrh are stir fried or pan fried, but these can also be deep fried for more crisp and better taste. typically the stuffed green chilli fry is served as condiment or side dish for simple meal like dal rice or rasam / sambar rice. in other words it is used as taste enhance for day to day simple lunch or dinner. however these days it is also served with street food snacks to increase the spice level and temperature. 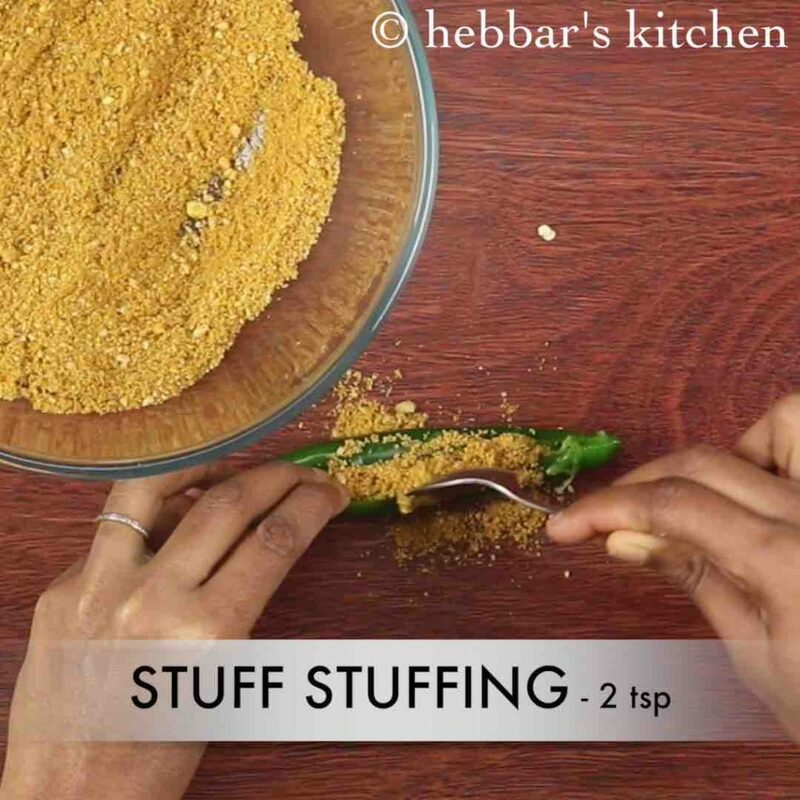 in addition, in this recipe, i have used peanut based dry spices as a stuffing which helps to lower the spice level. but the chillies can be simply pan fried or deep fried without stuffing and deseeding the chillies. this would result in a extreme spicy mirchi fry. 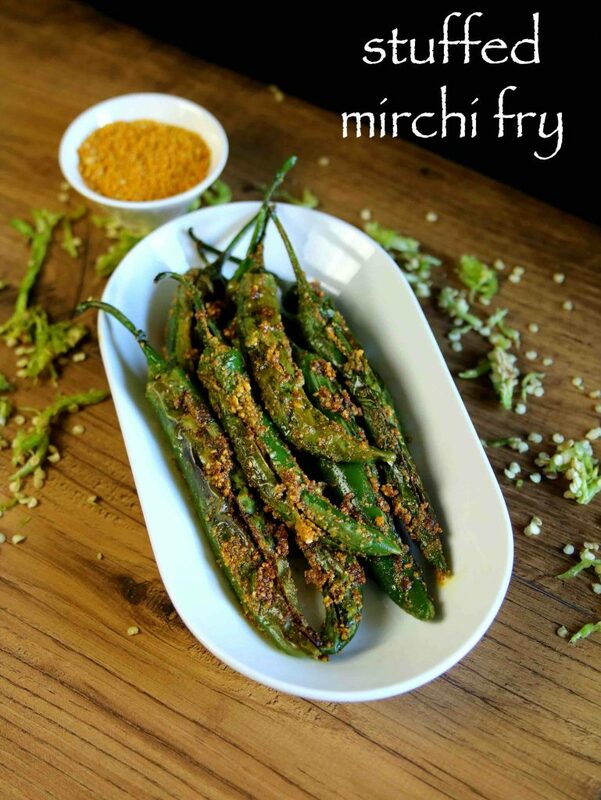 this recipe is extremely simple without much complicated steps, yet i would like to add few tips for mirchi fry recipe. firstly, i would recommend to use less spicy green peppers or chillies for this recipe. preferably jalapeño peppers are ideal for this recipe with sufficient space for peanut stuffing. secondly, i have deseeded the chillies before stuffing which reduces the spice level. however if you prefer to be spicy then you can keep it as it is. lastly, do not over cook the chillies otherwise it would loose its crunchiness and turns out soggy. 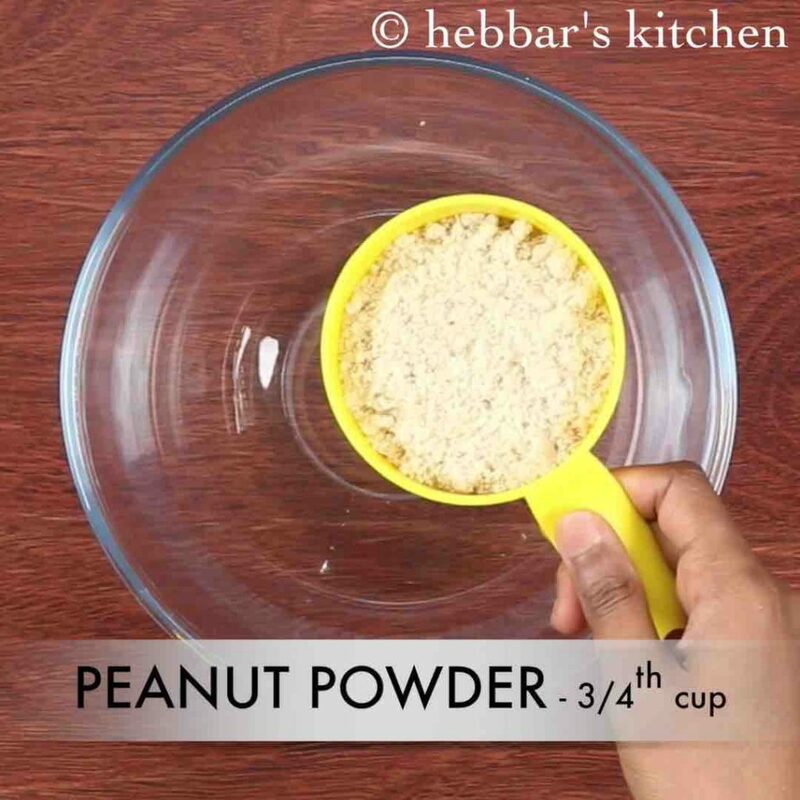 firstly, in a large mixing bowl take ¾ cup peanut powder. to prepare peanut powder, dry roast peanuts and remove the skin. 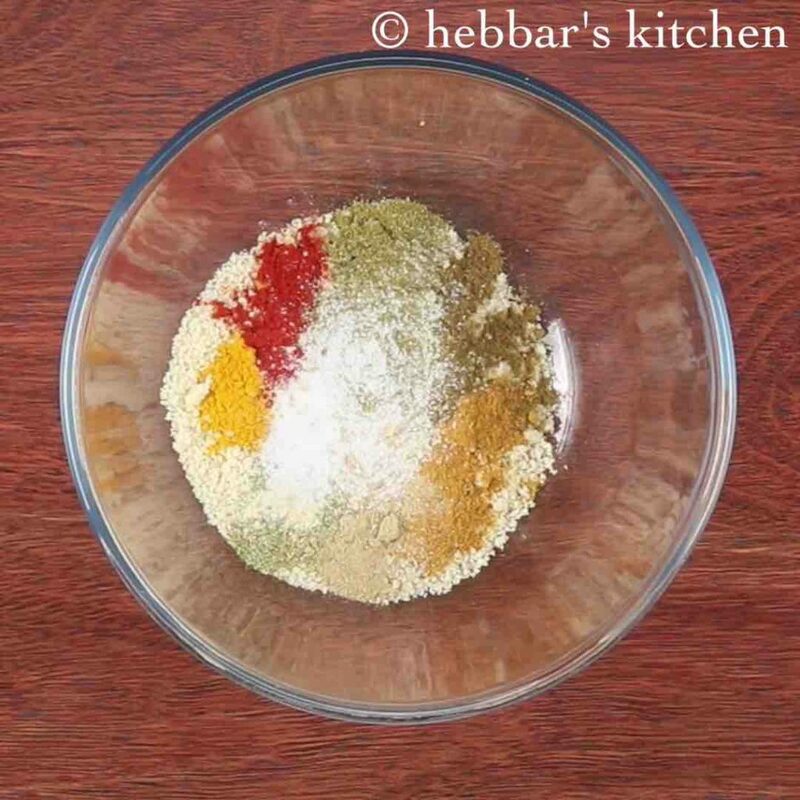 further blend to coarse powder. 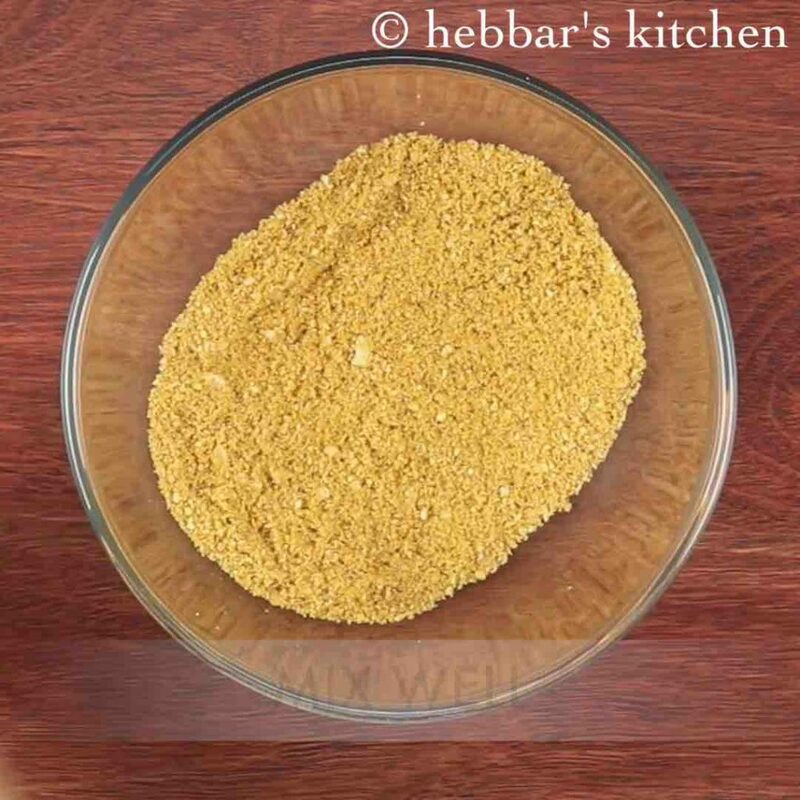 also add in ½ tsp turmeric, ½ tsp chilli powder, 1 tsp coriander powder, ½ tsp cumin powder, 1 tsp garam masala, 1 tsp aamchur, ½ tsp fennel powder, pinch of hing and ½ tsp salt. 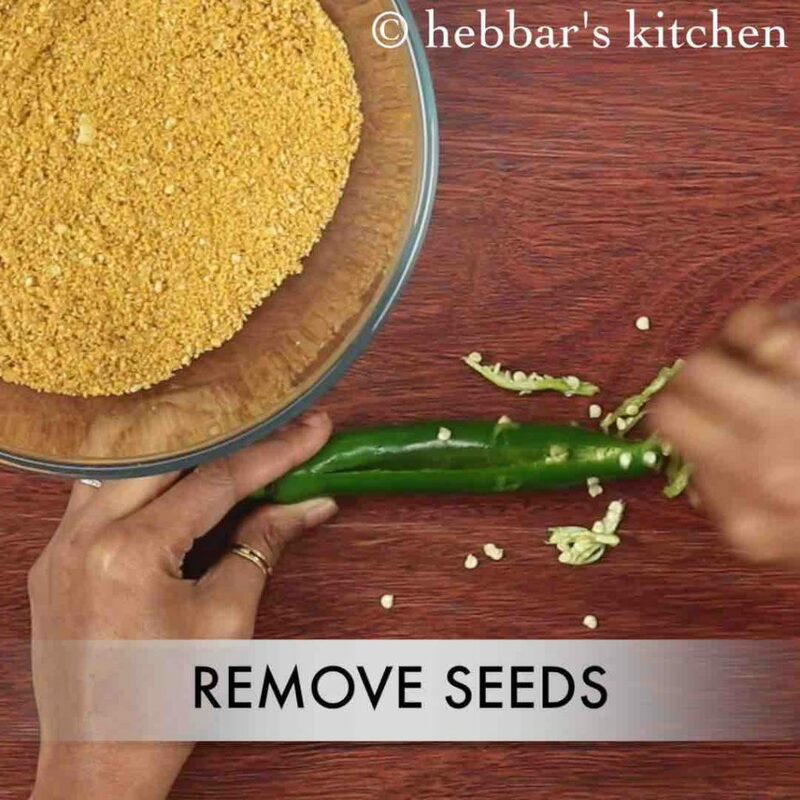 now slit the medium spices green chilli and remove the seeds with the help of back of spoon. stuff approximately 2-3 tsp of prepared peanut stuffing. 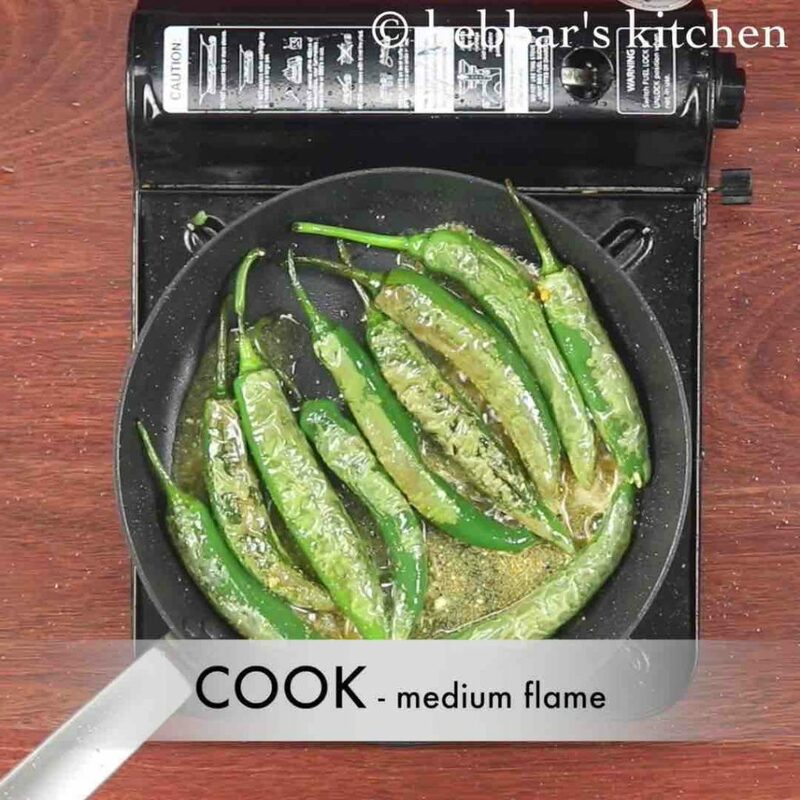 also heat 2 tbsp oil in a pan and place stuffed mirchi. cook for a minute or until the blisters appear on chilli. flip the chillis and cook on all sides keeping the flame on medium. once the chills are cooked from all sides, add in leftover stuffing mixture and allow to simmer for a minute. 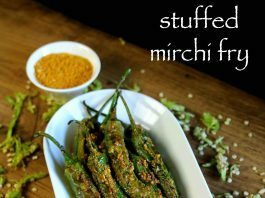 finally, serve stuffed mirchi fry as a appetiser or as a side dish with your dinner. once the chills are cooked from all sides, add in leftover stuffing mixture and allow to simmer for a minute. do not over cook as the chillis will loose its crunchiness. 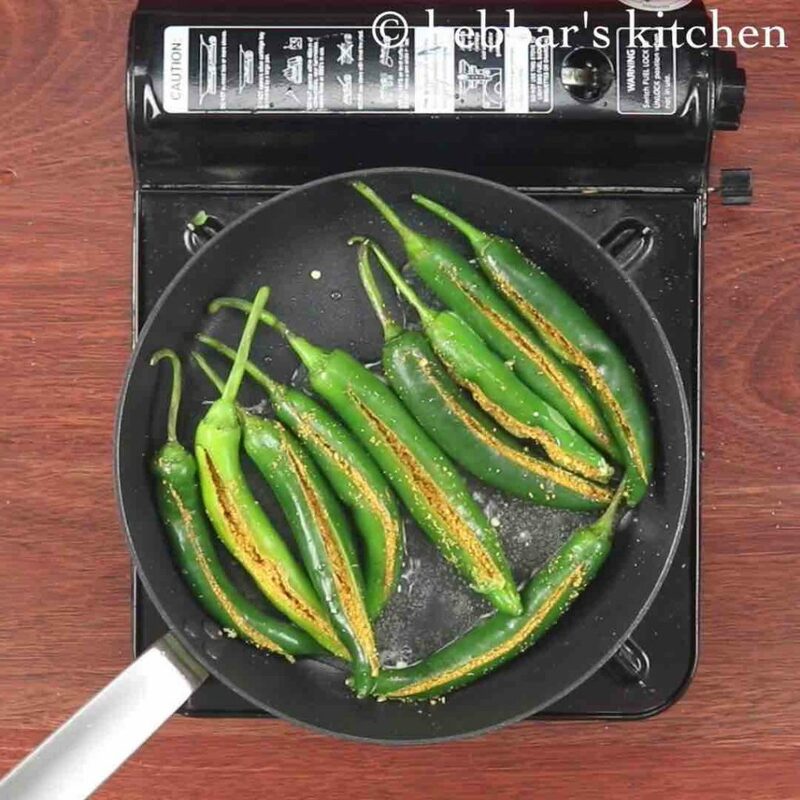 firstly, use medium spices chillis, else the mirchi fry will be more spicy. also, add a tbsp of coconut into stuffing, for more rich flavour. additionally, the chilli fry taste great by squeezing a tsp of lemon juice at the end. finally, serve stuffed mirchi fry immediately or stays good for a week when refrigerated.